Sassari is Sardinia's second most important town and its industrial centre; it boasts a rich history and a variety of shops. the provincial capital, is quite near Alghero and worth visiting, particularly if you happen to be in the island on Ascension Day when the Cavalcata Sarda is held, one of the most important and best festivals in Sardinia, a huge display of horsemanship and local customs. As an inland town, with centre squares and boulevards, it avoids an influx of tourists and remains a hive of local activity. 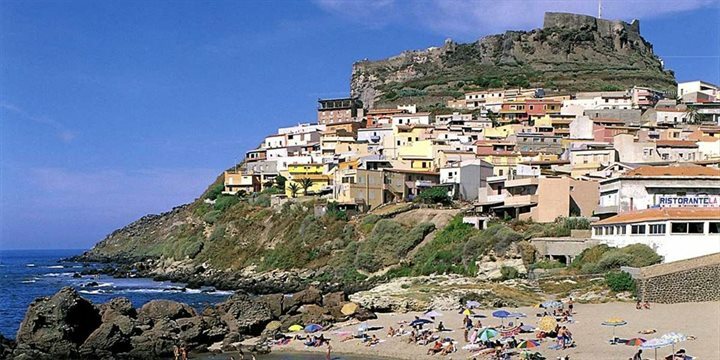 Founded in the 12th century, Castelsardo is a Genoese clifftop city which, like many much of Sardinia, has undergone various foreign occupations. After the Genoese the Spaniards arrived in 1326 and renamed the city Castel Aragonese and the town only became Castelsardo in the late 18th century under Piedmontese rule. Whilst in Castelsardo a visit to the medieval Castello is worthwhile from where, weather permitting, you can see across to Corisca. During Easter Castelsardo holds a series of Masses and local processions, culminating in a torchlight parade through the ancient town ending at Chiesa di Santa Maria. Bosa has a very attractive old quarter lining the river bank, and is famous for its sweet Malvasia wines. Due to the fertility of the land that surrounds the river, this area has been inhabited since ancient times and evidence of this is still clear with various historical monuments still intact. Bosa is stretched over a hill with outstanding views of the ocean and mountains. Bosa Marina is a new addition to the town with a long sandy beach and variety of water sports on offer catering to tourists and locals alike. This outstanding area arguably has the best beach in Sardinia or at least on the northern coast, and enjoys a fantastic panorama across the unspoilt and protected island of Asinara. Its crystal clear waters lure tourists here and have made this charming village one of the most famous tourist resorts. The unspoilt National Park of Asinara can be reached from the Porto Nuovo. Pelosa beach is by far the most popular beach with its dazzling white sands and close by is the Tower of Piana Island.